At our Leawood general dentist office, we can keep your teeth clean, healthy and beautiful. Our services include teeth cleanings, dental restorations, teeth whitening, dental bonding, dental crowns, dental veneers, dental bridges, dental implants, smile makeovers and more. Regardless of the challenge, you are having with your oral health, we can help. One area of our practice that is important, but often overlooked, is our ability to treat gum disease. As a general dentist, we recommend that patients visit our office for an annual comprehensive periodontal evaluation to assess signs and likelihood of developing periodontal disease. The recommendation stems from the growing rate at which people in the U.S. develop periodontal disease, a severe form of gum disease. If you have had or currently have periodontal disease, you may be among one of every two American adults over 30 years old who have gum disease. The facts surrounding periodontal disease are startling, but before you become too concerned, remember that visiting our office can help in many ways. According to data from the CDC (Centers for Disease Control and Prevention), approximately 65 million or more adults have periodontal disease. This number continues to grow with age, but it can be limited, starting with you. If you have periodontal disease, don't hesitate to receive treatment before you suffer detrimental results. The health risks related to periodontal disease include diabetes and cardiovascular disease. In addition to these serious diseases, you can also sustain tooth loss, gum recession, chronic mouth discomfort, and teeth and jawbone shifting as a result of untreated gum disease. Our general dentist office can treat you before these symptoms occur, and we can help repair your dental structure following related damage. Men have a higher risk of developing gum disease than women by nearly 20 percent; however, women become more at risk for gum disease and tooth decay during pregnancy due to a natural increase in bacteria production and a weakened immune system. Smokers also have an incredibly high risk of developing periodontal disease since their soft and hard oral tissues are constantly exposed to toxins. Some patients are genetically predisposed to suffer from gum recession and periodontal disease, which is why it is so important to receive your annual evaluation from a periodontics office. Those who have poor oral hygiene, only brush once a day, and do not floss are more likely to have gum disease at some point in their lives. 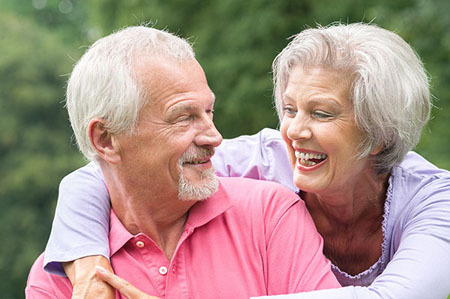 Around 70 percent of adults 65 and older have periodontal disease. Anyone who has a disease that compromises their immune system is also more likely to receive oral infections. If you fall into any of these risk categories, please don't hesitate to visit our general dentist office to learn more and increase your likelihood of maintaining healthy teeth and gums. If no treatment is necessary at the time of your visit, we can share habits you should include in your daily routine to reduce your chances of gum disease. We can help you keep your gums and teeth disease-free by providing you with necessary treatments to remove excess plaque and tartar (hardened plaque) buildup. Once you know your risk of developing gum disease, you will be better armored to fight the detrimental condition. We can provide you with some necessary repairs if you have sustained damage as a result of gum disease. For more information about periodontal disease and the treatments, we offer to help, visit our general dentist office as soon as you can.